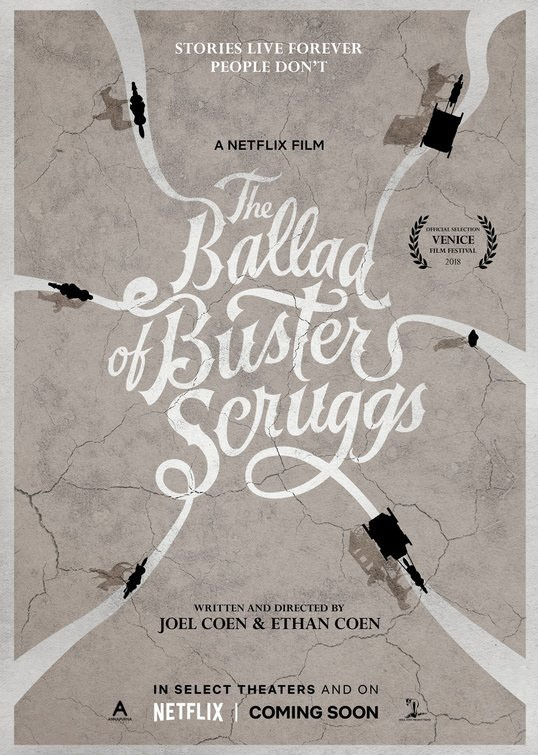 The Coens are back with another oddball project, an anthology that, in some ways, is more coherent than a lot of their monolithic narratives; and it's a damn fine thing, too, although that doesn't stop parts of it from being somewhat less than worth your time. If anything's for sure, it's that those Coen Brothers love Westerns, and despite all the celebration of the filmmakers for their excellence across an array of genres—often enough without leaving the confines of any individual Coen Bros. film, at that—it captures just about every movie they've ever made to describe it variously as a Western, a crime thriller, a comedy, or some combination of all three, or, if necessary, as A Serious Man (which people will tell you, and not without justification, is a comedy). But the siblings' conjoined heart has belonged at least as much, though they've kept it subliminal till now, to the anthology. And maybe the Coens themselves didn't realize this about their sometimes deceptively-shaggy, sometimes just-plain-shaggy yarns until their last film, 2015's Hail Caesar!, which revealed itself as something tantalizingly close to an anthology of Old Hollywood genre movies, almost (not quite) tied together by a "real" story, involving a harried and exceptionally hands-on film executive, which allowed the Coens to put, for example, an upright singing cowboy in the same movie as a Gene Kellyish beefcake and a dim-witted centurion. It's arguable, as I might argue it myself, that Hail, Caesar! could've only benefited from the Coens realizing this before they made it. 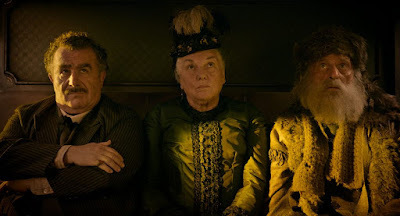 But better late than never, and hence their new, avowed anthology film, which earns my approbation for skirting the theaters I dislike and letting me watch it at home (both funded and distributed by Netflix, it finally dispels the streaming service's curse). What we have here are six short films, most of which are roughly the same length, some of which feel significantly longer than others, each of which features its own self-contained weird Western tale, and all of which are tied together by their shared genre exercise (to deliver six stories representing various facets of "the Western," a form defined more than anything by its setting and its attitude, and therefore containing a multitude of different storytelling modes) and by their mutual philosophical bent (all humans, without exception, will eventually die, and in Westerns, usually at another human's hand and as soon as dramatically feasible). 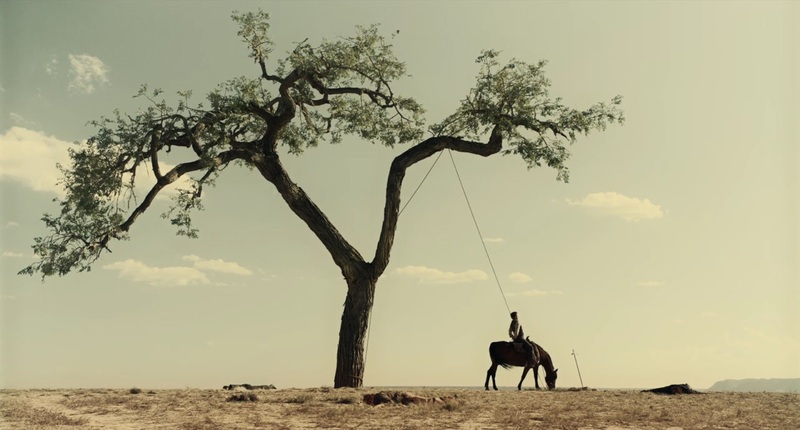 While perhaps not technically titled The Ballad of Buster Scruggs and Other Tales of the American Frontier, With Color Plates, perhaps it should've been, for that's the name of the prop of the extraordinarily handsome collection of short stories which the film purports to be illuminating. 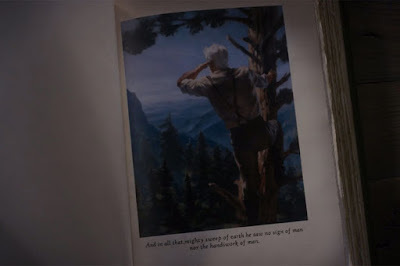 Indeed, going by how often you can read its pages (something I recommend pausing the film to do, because it elucidates the segments even further, and because its Netflix release means you can), it might not even be "a prop," as such, but a copy of an actual book with a print run of one. Either way, it's not a mistake that it opens with its own singing cowboy. 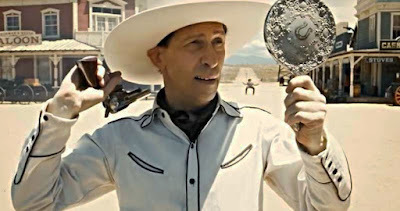 This, of course, is Buster Scruggs (a glorious Tim Blake Nelson), of "The Ballad of Buster Scruggs," which is the best thing the Coens have ever done. Okay, this is hyperbole; but it is the best thing the Coens have done in a while, and not a second of it is anything less than pure joy. This joy manifests in different ways throughout, however, starting with the song in Buster's heart (presently a beautifully banal ditty called "Cold Water"), echoing off the side of rock formations and down the dusty plateaus of a fantastic American West as imagined by the Coens and their cinematographer, Bruno Delbonnel, setting the tone here with a candy-colored landscape that manifests often as not as two near-solid fields of orangey-pink (ground) and soft baby blue (sky). At the conclusion of his tune, Buster reveals that, in a way, he's been singing to us all along, and introduces himself as, effectively, the mouthpiece of his creators, who use his direct address to reply to the career-long criticism of the Coens as misanthropes. "Misanthrope?" Buster just doesn't expect much of his fellow man; this, he says, helps him not to be disappointed. And there would be much to be disappointed by, if not for the cheerful attitude he takes, given that the world of "Buster Scruggs" is a perpetual gauntlet of unmotivated cruelty that has been populated exclusively by hyperactive, hyperviolent cartoons, Buster being our hero only in the sense that he's the most hyperactive and hyperviolent of all, the only possible survivor of a morally apocalyptic universe. 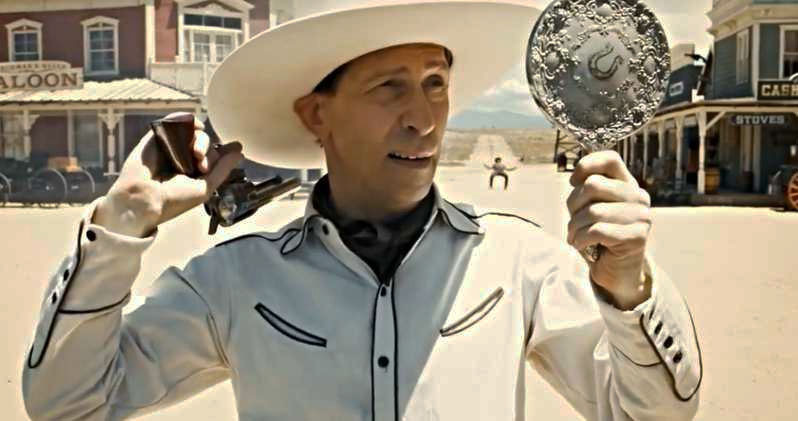 There's something in the way that Buster is differentiated from the rest of the hellscape almost solely by his spotless white costume, his friendly horse, his pleasant demeanor, and his sheer skill at the task of killing ("best not overthink it," says Buster, lining up a trickshot in his trusty hand mirror). Certainly, one of the throughlines of Ballad's six stories is the abiding thesis that the myths of the West as a crucible through which America was rid of its impurities, or as an empty space where the American Dream was rendered a reality, are only a tweak or two away from a reminder that we're mostly descended from people too violent and antisocial to fit into Europe, and who upon their arrival on this continent savagely clambered over one another to survive in a wilderness largely unfit for their habitation. From there, Ballad dives pretty much headlong off a cliff, and while it's only once out-and-out bad, once you understand that this really is the film's new normal, you will curse each new segment for daring to share a runtime with "The Ballad of Buster Scruggs," and curse Joel and Ethan Coen for making an anthology in the first place rather than figuring out how to make "Buster Scruggs" a feature, for while it does not insist upon itself as the stuff that even a 90 minute movie could be made of, perhaps better to have a near-masterpiece of an hour and a half than a masterpiece of 17 minutes that you can't watch by itself without feeling slightly guilty if you don't finish the nearly two full hours remaining. In fairness, this leap downward is not instantaneously apparent, and "Near Algodones" is another comedy, hardly less high-spirited if perhaps a touch less high-flying in its tone—it's the Spaghetti Western riff, with shout-outs to the most famous part of A Fistful of Dollars (but not nearly as funny as Back to the Future Part III's) and one of the more amusing parts of The Good, The Bad, and the Ugly. I didn't note anything from For a Few Dollars More or Once Upon a Time In the West, but it's been a while. "Meal Ticket" feels like them whining, though, which is obviously much worse. 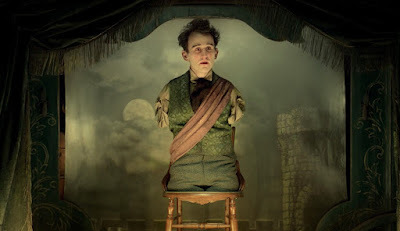 It's about an impresario (Liam Neeson) who carts around a quadruple-amputee actor (Harry Melling) to the diminishing enthusiasm of crowds who weren't especially enthusiastic to see a nerd recite quotes at them (Shakespeare, Lincoln, God) in the first place, and you already know how it's going to end just from the set-up. It's not very compelling in the getting there, either, which takes an extremely long time. "All Gold Canyon," adapted from a Jack London story, is an immediate step up, despite reducing the number of characters from "two" to "one"—somehow, there's still more dialogue—and this one's concerned with an archetypal grizzled prospector (Tom Waits, but of course it is) who comes across a stretch of virgin valley with a small creek winding through it, and who proceeds to dig a bunch of holes in it looking for gold. 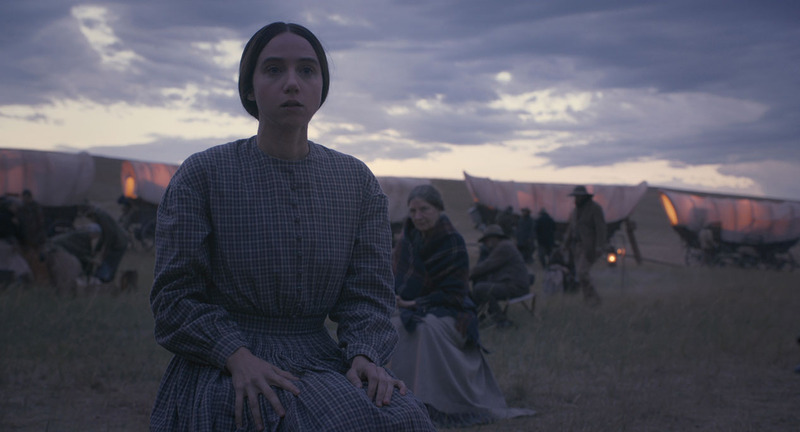 The (objectively) longest segment, "The Girl Who Got Rattled" (based on the Stewart Edward White story) is also the other one, besides "Buster Scruggs," that feels like the Coens might've been thinking of a feature. In this case it's for the best that it got a short treatment instead, though it's also possible that a feature's greater scope would've brought out even more of the humanity of the piece. It centers on Alice Longabaugh (Zoe Kazan) and her brother Gilbert (Jefferson Mays), and on the wagon train they've joined heading to Oregon (unfortunately, nobody dies of dysentery, but someone does die of cholera), led jointly by Mr. Arthur (Grainger Hines), an old hand, strong and silent, and Billy Knapp (Bill Heck), a younger man who takes a romantic interest in Alice, despite her brother's dubious and perhaps entirely-imagined betrothal of her to a business associate he might not even have out in the Oregon Territory. It ends in an Indian raid, and I don't know—is it worth pointing out that Ballad has substantially more inevitable-force-of-nature-style Indian raids than you would expect in a movie made in 2018? Well, it has two. 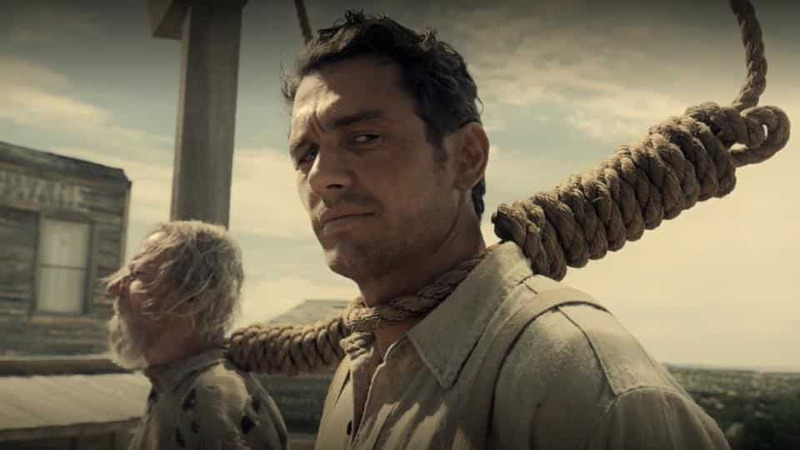 Things come to their most appropriate conclusion with "The Mortal Remains," basically No Exit in a stagecoach. We find five travelers, ostensibly on the road to Fort Morgan in the care of a nameless, faceless driver, who never speaks, and never stops. Three of the travelers are visiting Fort Morgan for the first time: an ebullient Frenchman (Saul Rubinek), a yammering fur trapper (Chelcie Ross), and an eastern lady of good breeding and strong Christian faith (Tyne Daly), hoping to meet her husband after some years of separation as he went west ahead of her to spread his interpretation of the Good Word. Two, however, have been down this road many times before, a pair, a "tandem," of bounty hunters, respectively English (Jonjo O'Neill) and Irish (Brendan Gleeson) in their persuasion. They carry a corpse as their cargo. It is not-so-subtly implied their fellow passengers share his condition, along with his destination. 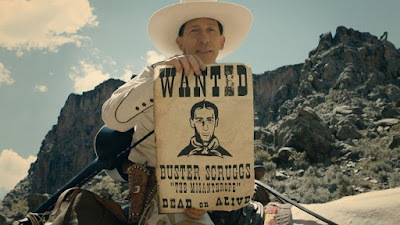 It's well that The Ballad of Buster Scruggs is bookended so strongly, since it winds up being disappointing in a fair number of ways. Truthfully, most of that disappointment is just the fact it never again comes close to the annihilating perfection of its first twenty minutes. But it's disappointing, also, that some segments ("Algodones") are too short, and some ("Ticket") are way, way too long. It's disappointing that it occasions only modest formal innovation from the Coens and Delbonnel, with subtle differences in the computerized look of the thing that are noticeable, but tend to be swallowed by the similarities, and with barely a nod toward recapturing the aesthetics of the subgenres with which their film grapples (some of them separated by oceans and decades of technological change), instead just encasing them all within a standard widescreen ratio and poppy colors that are distinct across the segments mostly in the difference between "daytime" and "night." It's never disappointing because of its dialogue; let's give the bros the credit they're due. But it's disappointing because it should be better: the best thing about it is "Buster Scruggs," and the second best thing about it is its framing device. It doesn't mean, though, that it's not still really good.